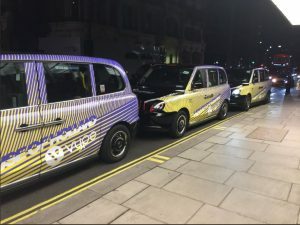 London Fashion Week 2018 took place 14th-18th September following by London Fashion Week Festival on the 20th-23rd September. It showcased over 250 designers to a global audience of influential media and retailers. What’s more, it is one of the “Big Four“ fashion weeks along with New York, Milan and Paris. London Fashion Week is an opportunity for brands to associate with one of the key retail events of the year. This year we had a pleasure to work with well recognizable high end brands – House of Holland & Vype. 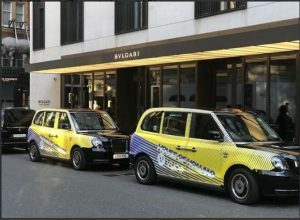 They showcased their iconic design on our new Sherbet environmentally friendly electric taxis. 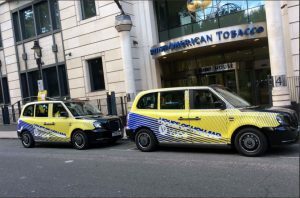 Taxis were available all throughout the LFW events and parties to use for the House of Holland & Vype VIP guests. 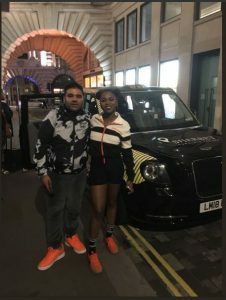 Guests included well known talented musicians such as Nadia Rose and the The Naughty Boy. LFT brings in over 5000 press and buyers with orders of over £100 million, with visitors attending from over 70 countries it is a truly global event that generates large scale social media involvement.